Online Payday Loans Illegal In Virginia? Online payday loans are illegal in Virginia. Yes, that is right… for companies not registered in Virginia. If the company is located in Virginia it must have a physical location. So for the most part the vast majority of online payday lending websites are illegal in Virginia. Yes, you can get them online. They will make the withdrawal from your bank account and you will get collection calls when you don’t pay. So what does it mean that they are “illegal”? We’ll it means two things. First, they could be prosecuted assuming we could extradite them from Poland, Russia or some other extremely faraway places. Chance of this? Zero. Second, it means they can’t sue you in Virginia — which is required for a garnishment, levy or lien. But make no mistake: that won’t stop them from calling you and threatening you. Those threats well go something like this…. A guy with an Indian accent but with an Irish name like “Thomas O’Reilly” will call and threaten to have you arrested if you don’t pay. Why an Irish name? No clue, unless they think all Americans think the Irish are thugs. 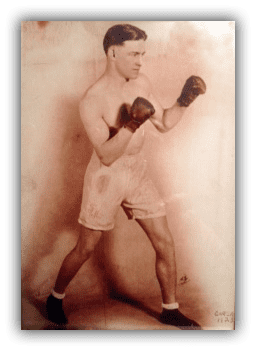 Well, my Irish-American grandfather was an accomplished amateur boxer. Frankie Merna (picture circa 1923) . He is in a few online record books. And yes he did go to work for the unions in the 1930’s. I’m sure on the streets of South Boston he doled out a right good “clatter” (Irish slang for “beating”) on a deserving few. You didn’t take boxing classes to become a boxer in the Irish ghettoes of South Boston in 1920’s. Fit the stereotype? Maybe. But a stereotype of bygone days. Anyway, it is not possible to go to jail for not paying a commercial loan, and it is also illegal to threaten criminal action for non-payment of a debt. So you see the online payday loan is illegal. How some of them try to collect on it is illegal. And there is really nothing legally they can do to you. But the point shouldn’t be that you’re safe. My point here should be if you are relying on payday loans whether online or in-store, you are in a financial pit, a pit that you need help getting out of. You can ignore it and keep scanning for online payday loans to rob a new Peter to pay an old Paul. But I think you should consider investigate what a bankruptcy can do to get you out of the pit. And guess what? I’m a bankruptcy attorney surprisingly enough, so give me a call. While the thought of a young Frankie Merna doling out a good clatter on the evil foreign and some not-so-foreign online payday lenders gives me much pleasure, I get as much pleasure out of educating you that you are safe and don’t have to pay them. So when you get the call from “Thomas O’Reilly” just tell him in your best Irish accent … “Feck off!” (American “Go away” = Irish slang “Feck off”). Granddad would be proud of you. OVERWHELMED WITH DEBT AND HARASSING COLLECTION CALLS? CALL FOR A FREE BANKRUPTCY CONSULTATION OR SCHEDULE ONLINE BY CLICKING HERE.